Where Does The Island Fox Live? The island fox ( Urocyon littoralis ) is found only on the Channel Islands located between 19 and 61 miles off the coast of Southern California. Many of the islands can be seen from the shore on a clear day. Of the eight islands, foxes are only found on six. 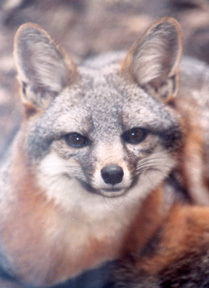 Each island has its own genetically different island fox subspecies. California’s Channel Islands are each unique and, like the Galapagos Islands, a treasure of biodiversity. San Miguel Island is a sandy, wind-swept plateau with rocky beaches. There are no large trees or shrubs. It is only 8 miles long by 4 miles wide, yet it is the most important sea bird nesting site in Southern California. It also is home to one of the largest pinniped breeding colonies in the world, over 126,000 animals, including: the northern elephant seal, harbor seal, Steller’s sea lion, sea otters and the endangered northern fur seal and Guadalupe fur seal. Approximately 90% of the California sea lion population breeds on San Miguel and San Nicolas Islands. Foxes share the rugged terrain with creatures unique to the Channel Islands – the silk-spinning sand cricket, Channel Islands slender salamander, Island western fence lizard, several island subspecies of birds, the endangered snowy plover and the bald eagle (reintroduced 2001). Santa Rosa Island is, for the most part, dry rolling hills of grassland. The other half is wooded canyons, coastal cliffs, wetlands, and sandy beaches. The island is 10 miles long by 15 miles wide. It is home to one of the rarest pine trees in the world - the Santa Rosa Island Torrey pine. Important fossil discoveries have been made on this island, including 13,000-years-old human remains and numerous pygmy mammoth skeletons. Foxes share the grasslands with pygmy grasshoppers, island cicadas, and the island gopher snake. They also share habitat with an island species of spotted skunk and over 195 species of birds, including: the endangered snowy plover and bald eagle (reintroduced 2002). Six other species of plants are also endangered on this island. Santa Cruz Island has mountains, valleys, streams, and rugged coastline. It is actually two separate islands on opposite sides of a geological fault. Twenty million years ago the two pieces of land slid into each other to create one island. One half is volcanic, while the other half is layers of sedimentary rock. Ancient species of plants and animals from the two original islands can be found on the different sides of the fault (ie. the Channel Islands slender salamander on one side, the black-bellied slender salamander on the other). Many plants on Santa Cruz only grow in specific soils on one side or other of the fault. At 24 miles long and 6 miles wide, it is California’s largest island (3 times the size of Manhattan) and has the greatest plant and animal diversity of all the islands. It is also home to the world’s longest sea cave (1,227 ft.). The fox preys on the Santa Cruz island deer mouse and the endangered Santa Cruz Island harvest mouse. It shares its varied terrain with other unique species – the island scrub jay, flightless katydid, Santa Cruz Island woodland skipper butterfly, the Santa Cruz Island cicada, and 10 species of plants found no where else in the world, including the Santa Cruz Island pine and the endangered Santa Cruz Island silver lotus. Anacapa Islands are a volcanic string of three small islands with dry grassy bluffs, steep cliffs and black sand beaches. The eroded volcanic shoreline has a natural bridge and other scenic formations. At 5 miles long but 1/4 mile wide, the only native land mammal is the Anacapa deer mouse. However, this island is home to numerous island plants and is an important sea bird nesting site. It has the largest breeding colony of brown pelicans in California. Santa Barbara Island is the smallest of the Channel Islands at only 1 mile long by 1 mile wide. Its steep, rugged volcanic cliffs rise to a grassy plateau with no trees. There is only one native land mammal, the Santa Barbara Island deer mouse, but there are 30 species of sunflower. This tiny island is an important sea bird nesting site and home to the largest breeding colony of Xantus’ murrelets in the world. Santa Catalina Island is the most populated of the Channel Islands and has a thriving recreation and resort area. Twenty-one miles long by 8 miles wide, the terrain includes mountains, steep canyons, woodlands, grassy hills, and rocky beaches. Bald eagles were reintroduced here in 1995, but DDT remains in the environment at high enough levels that the eagles are still unable to reproduce without human intervention. This is the only Channel Island where foxes live with rattlesnakes and the two-striped garter snake. Foxes also share habitat with the Santa Catalina subspecies of deer mouse, harvest mouse, ground squirrel, California quail, Bewick’s wren, and 10 butterflies, including the Avalon hairstreak. Here, foxes live among numerous rare plants including the Santa Catalina Island ironwood and the endangered Catalina Island mountain mahogany. Marine mammals frequent but typically do not breed on this island because beaches are used by people, but the island is home to an arboreal salamander and 4 species of bats. San Clemente Island is a dry grassy plateau (21 miles long by 3 miles wide) rising from the sea to steep cliffs at the far end. The U.S. Navy uses the island for training operations. This island has the largest number of plants found only on one Channel Island, including 8 endangered species and 138 species of lichen. The native plant life has been recovering since the removal of invasive exotic animal species. The foxes on this island have had to learn to live in harmony with an endangered bird, the San Clemente loggerhead shrike. At one point foxes were removed from the shrike’s nesting area to save young birds. All island foxes in zoos come from this island. Foxes also share the island with the island night lizard, numerous birds and 4 species of bats. San Nicolas Island is a grassy plateau with sand dunes (9.7 miles long by 3 miles wide). Because it was overgrazed by sheep and other exotic animals, no native trees remain. Today, the island is occupied by the U.S. Navy, but still remains an important breeding site for marine mammals. Sea otters were reintroduced beginning in 1987 and 90% of the California sea lion population breeds on San Nicolas or San Miguel. It is also an important sea bird nesting site. Foxes share this windswept terrain with the San Nicolas Island deer mouse, the island night lizard,and a variety of island subspecies of birds, including Bewick’s wren, house finch, orange-crowned warbler, and horned lark.